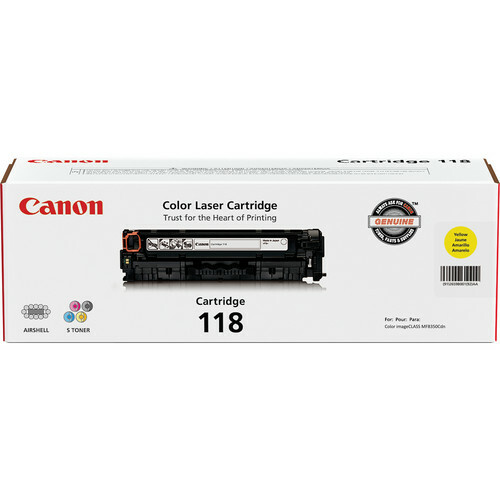 Box Dimensions (LxWxH) 15.0 x 5.0 x 4.5"
118 Ink Cartridge (Yellow) is rated 4.8 out of 5 by 4. Rated 5 out of 5 by Anonymous from That was easy! Works wonderfully, just what I expected from Canon. Delivered quickly and in excellent condition, just what I expect from B&H. Rated 5 out of 5 by Dronnis from Great price Quality product, best price, and delivered as agreed. I enjoy doing business with this company. Rated 5 out of 5 by Lisa from Not just as good as the real thing - it IS the real thing! Genuine Canon toner at a great price and fast delivery. Couldn't ask for more. Rated 4 out of 5 by Anonymous from I would buy this product again It is very reliable, never had any problems with it.